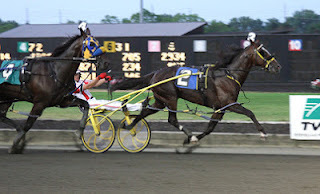 The first million-dollar race in harness history is now worth $600,000 but it loses none of its stature as one of the three primary events of the season for soph-colt pacers. All eyes are on the field of 10 in this Saturday night, July 14’s Meadowlands Pace. They are evenly matched, most think, even though the obvious Sweet Lou is the strong morning-line favorite. Also this weekend, the Meadowlands presents frosh colt-and-filly pacers in New Jersey Sires Stakes action on Friday, July 13 and soph-filly pacers battle in the Mistletoe Shalee final on the “Pace” program. The Pace is part of a $100,000 guaranteed Pick-4 pool that spans races 10-13. Also on July 14 at the Meadowlands, Hambo-hopefuls clash in the Stanley Dancer and Hambo-Oaks eligibles go in the Del Miller. Along with Pennsylvania Sires Stakes for colt trotters at Pocono, the square-gaiters are exercising for the big dance on Aug. 4. For an analysis of those events, go to our exclusive Hambletonian Trail. The result stories (and archived reports of all the eligibles performances in stakes since May) are at the Hambletonian Society. In addition, there is some hot Midwest action afoot. Hoosier Park offers Indiana Sires Stakes finals, Hazel Park presents the William Connors Memorial Final and the Grand Circuit Hanover events adorn the cards at Balmoral Park. 10. Allstar Legend - Jim Morrill Jr. The Pace is part of a $100,000 guaranteed Pick Four pool that spans races 10-13. Although the Meadowlands Pace is worth $400,000 less than usual, it does not take away from its prestige. It, yet again, drew a field of the best three-year-old pacers in the world. But, the 2012 Pace has one detail that separates it from any other—the caliber and talent of these pacers make them inseparable. All eyes are still on Sweet Lou, who gets a tepid 5-2 morning-line-favorite status. But this race seems to be developing like the North America Cup. Sweet Lou has proven he is a one-dimensional horse that will likely perform the same move he made in the North America Cup and his Pace elimination (he made the same one-brush move to win the Breeders Crown at two). If this is truly the case and Sweet Lou, new shoes or old, has only a single move in him, then a different sophomore will get his time to shine. A Rocknroll Dance is coming out of his elimination mile looking fantastic. Although he was a narrow second, he fought hard as soon as he found room to almost catch a wearying Sweet Lou. The only fault this colt has is that he always stays at the cones for too long and sometimes cannot find room to use his saved energy. 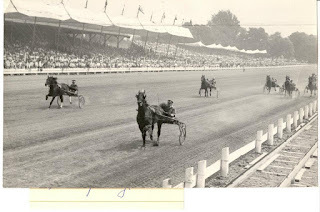 He got lucky in the “Hempt,” which he won, when the pocket opened at the right time for him to swing around and catch the early speed. Chances are, Yannick Gingras, who has been in the bike since “Dance” secured the number-two spot as a frosh against Sweet Lou, is going to get him a second-over trip and fly by Sweet Lou. Also with a shot is Bolt The Duer. He was expected to race great in his elimination but could not find racing room to make a better impression. But he got to the final and that makes him dangerous. As long as he gets an opportunity, he should be super sharp. In the trifecta, include Thinking Out Loud. He always finds a way to get the right trip. Likely, he will again, but may not have enough to beat Bolt The Duer or A Rocknroll Dance. Want to play a superfecta? Add Pet Rock. He showed a great deal of stamina in his elimination but clipped wheels with Thinking Out Loud, which made him and the North America Cup winner lose ground. Before that, he hit the gate and broke in the North America Cup. He needs to get a good trip to finish in the top four but that is the quartet that can shake up the prices, all combos leaving Sweet Lou out of the picture. Heston Blue Chip won his elim but did so with a perfectly smooth trip. This king of the current New York-bred sophomores is fast and can be furious but we are yet to see him against adversity. This mile will be more provoking than he may be able to handle. Simply Business was a horse we hammered last year as our choice in the Metro and he delivered at 20-1. At three he has not had the chance to take advantage of his late surging, which is his best quality. That talent might not equal the prowess of this division, however, and we doubt if he can pull off a stand-up win against the likes of this group when battling together. State Treasurer is another good pacer who should always be a contender but has not fully demonstrated a threatening quality against the others in the Pace field. Perhaps he is the perfect Little Brown Jug horse? He will be one to contend with in other stakes if he continues to keep up with these and certainly can slam lesser talent in the division. Time To Roll could be the best outside contender in the field. At one point we considered putting him in the top-choice seat but had to be realistic, projecting an unpredictable performance was not an option. Though we would not be surprised if he unleashed a new style that shook up the competition. He may be that good. Allstar Legend has his work cut out for him but he is certainly welcomed in this field, though he will find the 10 post a burden under any circumstances, certainly with the likes of the sustainable speed already proven by the foes inside of him. The $190,850 Mistletoe Shalee Final presents the fantastic American Jewel on Pace night and she towers over the field, as she has all in her soph-filly pacing division. We offer a probable longshot for second, doubting if she will overcome the prohibitive choice. That gal is the 10 horse, Destiny’s Chance. She has a lot of talent and may be launched to a great spot by Gingras early enough to make it into the picture, certainly at high odds. The “Circuit” hits Illinois this week, bringing the traditional Hanover Stakes for two- and three-year-olds to be tested in splits worth $28,000-plus-to-$50,000 plus. Our interest in value for wagers focuses upon the July 14 freshman splits. Among the colt divisions, beware of All Fired Up. This one is a son of The Panderosa and should display some wicked speed. In another division, we like Our Dragon King, a son of Dragon Again. Among the competition in his split, he is showing the most promise with the best bloodline. The other colt to watch is Agood Time To Rock. His sire is the productive Rocknroll Hanover, who has been responsible for some mighty fine two- and three-year-olds and continues to impress the early divisions with his latest crop. Among the fillies, we offer Dune In Red. Though we doubt this gal will escape the eyes of the public, she certainly seems to be the best of the group. In the soph-colt pace, Race 10, we like Jammin Joshua. The inside post should find him in a great spot to win his fourth of seven races. He has not been out of the money at three. In the soph-colt trot, Race 5, the Ron Burke-trained A Royal Peck appears primed to take the big check, looking for his fourth win in eight starts. In the soph-filly pace, Race 12, Soaring Honey, trained by Erv Miller, has been sharp, finishing first or second in seven starts and making it into this classy realm with a gritty style. In the soph-filly trot, Race 11, Angel Band is simply the fastest of this lot and as long as she can get away cleanly and command the fractions she may draw off and leave them all hoping for better days ahead. Harness racing at Hoosier Park ensues and playing the Thursday night programs at TwinSpires earns you 10 TSC Elite Points for all wagers on those program. Also, the Pick 4 features a guaranteed $5,000 pool (races four through seven). Post is 5:30 p.m. EST.